When attending a gallery, I often think of one of the catchphrases of Brian Sewell, Britain’s latest, greatest and perhaps most infamous art critic. The words are radically simple, a terse but not unkind rejoinder against the sterility and bourgeois high-mindedness of the Chelsea and SoHo scenes: “Provoke me.” This wish for provocation is not necessarily combative. Instead, the statement — the command — is really a deep-seated desire, a sort-of fire inside that sorely wants to be engaged by the art on view. That wish was fulfilled at the Rhode Island State Council for the Arts (RISCA) Fellowship exhibition on February 25. The exhibition, which will be installed until March 23, is truly a treat for the person who wants a contemporary and local gallery to offer works that excite and engage. 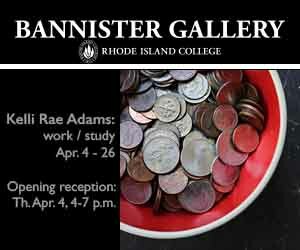 The works are hosted at Rhode Island College’s Bannister Gallery, a short drive up from downtown on a campus that offers ample parking and fine eateries on nearby Chalkstone Boulevard. Rhode Island’s State Council of the Arts (RISCA) has been a catalyst in stimulating the state’s art community since 1967. With a number of grants and fellowships available for application on the council’s website, the organization offers an easy-to-access and invaluable resource for artists all across the state. The selection of works on view is representative of RISCA’s fellows, who are given the means to produce these works by generous state grants. The fruits of local labor were astounding. I particularly gravitated toward Kerri Rae Adams’s 1276 Dollars, which featured the fascinating subtitle “One Month’s Salary on Minimum Wage.” The installation piece featured a stack of what appeared to be calcium-based coins that could be dropped into a jar of diluted water that dissolved the ovoids on entry. 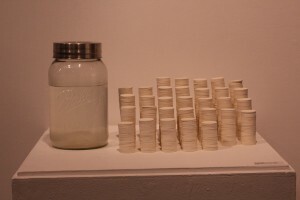 The process of watching the money liquify in the ghostly glass jar at first had little impact on me — being equal parts profligate and spendthrift — but as I watched the body of gallery-goers each take a turn at the installation, and the pile of 1,276 coins slowly dwindle, the depth and breadth of the very unassuming piece hit me in full force. Another piece that really captured my attention was Talia Levitt’s Garden. 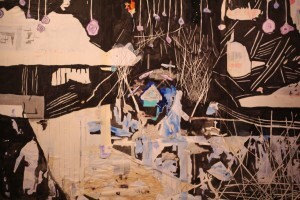 In mixed media painting, what intrigues me most often is the piece’s texture, which is natural given my formal training in both design and filmmaking — a bias perhaps, but one that allows me to enjoy Levitt’s work with a enthused passion, with most of my time during the evening spent with this particular piece. I do have a slight bone to pick with the gallery’s design, however. When entering the gallery proper through its single available entrance, there was a complete logjam. Curiously, the two most interactive installations were both placed at the entryway — Kerri Rae Adams’s aforementioned work and a meditation chamber. Unfortunately I didn’t even have the opportunity to engage with the latter piece because Capitol TV occupied the area for the entire evening. Any serious gallery-goer would be turned off by this arrangement, and it inevitably harms the artists’ work. Having to fight through throngs of people milling around the entrance and nearby reception area felt like a spatial design flaw that cannot be overlooked. Technical flaws aside, which inevitably are to be expected in a gallery with almost two dozen participants, the gallery offered a series of remarkable artists and remarkable artwork. I’d strongly encourage a visit during the show’s duration. The exhibition will be on view until March 23rd, with a closing reception Wednesday, March 25th at 6pm at Rhode Island College. Next post: Advice from the Trenches: Super Mother-in-Law! !